The southern province of Tataouine has the highest rate of unemployment in Tunisia. Some 1500 locals began protesting several weeks ago in El-Kamour, 100 miles from Tataouine. Abdul Aziz, 38, one of the protesters in El-Kamour sits on a small chair in front of the tent where he and a number of friends and relatives live for now. He scans the daily newspapers in search of the latest news about the social situation in Tataouine and the government’s reaction to their sit-ins, as well as the latest clashes between protesters and security units. Abdul Aziz is unemployed and married with two children and began protesting because he cannot make ends meet. Abdul Aziz’s story is common among protesters here who have set up hundreds of tents and have been carefully divided into campsites according to their 23 localities. Each campsite has a leader that looks after the camp’s affairs and represents it at joint camp meetings with the chief coordinators and the protesters’ spokesperson. Tataouine is the country’s largest province in terms of area. It boasts a history of defeating the French colonialists and defending the homeland. It was a bastion of the first and second Fallaga groups, the military arm of Tunisia’s Liberation Movement. More significantly, however, Tataouine hosts the biggest foreign petroleum companies, with daily revenues exceeding TND 7 billion (USD 3.5 billion). Yet, despite its rich history and oil resources, Tataouine is a marginalized region given little attention by the government, residents here say. With few work opportunities, residents live in poverty and the youth spend most of their idle time in coffeehouses, leaving them susceptible to extremism and/or migration. Tataouine, like several other areas in southern Tunisia, struggles with a regional disruption in terms of development and distribution of income over the coastal governorates and the remaining western and southern governorates, a situation that has been inherited from past decades where poverty levels in the western parts of the country exceeded 38 percent, compared with 15 percent at the national level, besides a decline of health and service facilities. The activists have brought to the ministerial delegations three urgent demands: to allocate 20 percent of the oil revenues for regional development and provide jobs for one member in each family, ensure accountability of the national oil company headquarters in the governorate, and to disclose the oil deals concluded between the government and foreign companies. “They have not demanded anything other than dignity,” said spokesperson El-Haddad. Shortly after the outbreak of the Totaouine protests, which escalated into a sit-down strike in El-Kamour, Prime Minister Youssef Chahed arrived at the scene accompanied by some ministers and senior government officials, with a package of decisions. Before the start of negotiations with the civil activists and protesters’ representatives, the official delegation was received with anger and anti-government slogans, which indicated that the negotiations would be dauntingly difficult. Indeed, the dialogue failed. The protesters believed that the 64 government decisions about developing projects, improving infrastructure, and providing jobs to unemployed persons did not measure up to people’s expectations, which further intensified tensions and deepened the sense of disappointment. Chahed and his team returned to Tunis empty-handed after failing to achieve any tangible results. Past experience suggests that there is mistrust between the Tataouine population and the successive governments. There have been many agreements with the authorities about promoting local development, improving the living conditions, maintaining infrastructures and hospitals, providing specialized medical staffs, creating new jobs, and other social issues. Yet none of these agreements were ever materialized and have led to mistrust and lack of credibility with the successive governments, including the Chahed government. 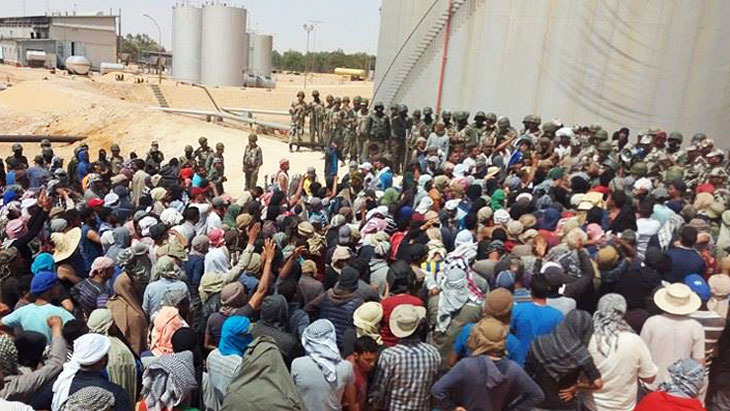 Bachir Saidi, director general of Tunisian Labor Union (UGTT) in Tataouine, said that UGTT has concluded many agreements with the authorities about the same demands raised by El-Kamour protestors, but the government has not honored its commitments, according to Saidi. “This situation has further deepened the population’s belief that the government is not serious and has only offered people false promises, causing more complications and pushing the people to continue their protests in defense of their legitimate demands and serious and responsible negotiations,” he added. Speaking about the effectiveness of government intervention and the seriousness of these negotiations, Minister of Social Affairs Mohammed Trabulsi said that the projects estimated at TND 300 million (USD 130 million) cover this year and next year and address employment, farming, energy, and other services. He argued that the protesters have persistently refused these offers and limited their employment demands to the oilfields. Minister Trabulsi claimed that the protestors always raise the ceiling of these demands and the government cannot offer them promises that are impossible to achieve or are against existing laws. Trabulsi said that the government was always ready to respond positively to any other proposals and that the dialogue with the protesters must continue in order to defuse tension and spare the country any more social upheaval. He added that the rumors circulated about the oil resources or huge oil revenues were mere hearsay and unsubstantiated allegations. He disclosed that Prime Minister Youssef Chahed decided to appoint an impartial committee to control oil and natural resources in Tunisia and disclose all facts concerned with this subject.